The Roaring Girle. OR Moll Cut-Purse. T. Middleton and T. Dekkar. As it hath lately beene Acted on the Fortune-stage by the Prince his Players. Printed at London for Thomas Archer, and are to be sold at his shop in Popes head-pallace, neere the Royall Exchange. 1611. 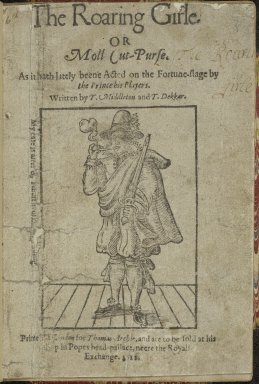 Title page imaged from Folger call number: STC 17908. Image is not from the transcribed copy.